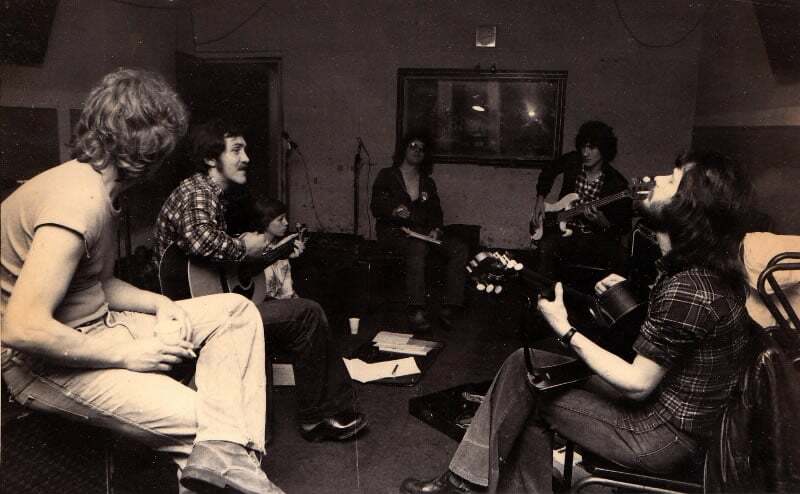 This is a session at PSL Studios at Wandsworth in 1977 in which, Rod and I can be seen rehearsing with other musicians for a separate project. Unfortunately, I don’t have a photo of the actual recording event made in 1981 for the Radio Mayday tapes. PSL Studios is where the main session for the Radio Mayday recordings were held. Although I seem to remember that we recorded Take the Weather and maybe one or two others in a studio situated in or near Grange Road in Thornton Heath. Rod and I had formed a gigging duo after working with the Wild Bunch and the New Frontier and, amongst many other musicians, Rod also prevailed upon my services as a vocalist for his songwriting ventures. In 1981 Rod landed a deal to record a compilation that would be played over the local airwaves at Croydon’s Mayday Hospital. The compilation was actually larger than is displayed on this website, but I’ve whittled it down to a selection of what in my opinion, were the better songs. Sometime in 1981, in a pub in Wandsworth just minutes away from PSL Studios, where Rod regaled us with some hair-curling anecdotes, jokes and banter, I found myself meeting the other two musicians Rod had roped in for the project. They were Nigel Smith on Bass and Piano, who I was informed, had previously worked with Ralph McTell, and Clive on drums, also known as Kipper, who’d been in the Trojans, a band contemporary with the Partisans that I sang with in earlier days with John Edmed on Lead Guitar. We visited Mayday Hospital after the recording sessions for a meeting with the DJ, and later there was some sort of party held for the event that we were invited to, with various prominent members of the community attending, though the guest celebrity Deryck Guyler is the only person I actually recall as being there. He was very sociable and came round to chat individually with everyone there. Rod was a very prolific and accomplished songwriter, who had previously sold many songs to various artistes and procured contract deals with record companies. He had an album of his own songs on which he played called, ‘In the Realm of Asgard’ released on Threshold ThS 6 for the Decca Record Company in 1972. Aside from the Paul Simon number in this compilation, all the others are original Rod Harrison compositions. I think they are rather well written songs with some clever lyrics.